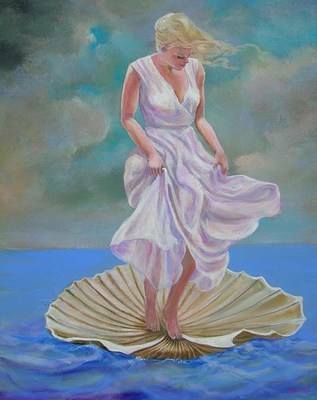 MAGNIFICENT ORIGINAL HIGH PRESTIGE OIL PAINTING "Birth of Venus". BY THE FABULOUS ARTIST DAVID ALDUS. A truly superb painting with a beautiful floating surrealist feel in tribute to the great Salvador Dali and Sandro Botticelli's famous painting "Nascita di Venere"" !!................. Highest price received for one of his paintings is £14,000. "Lot's Wife" Absolute investment opportunity!